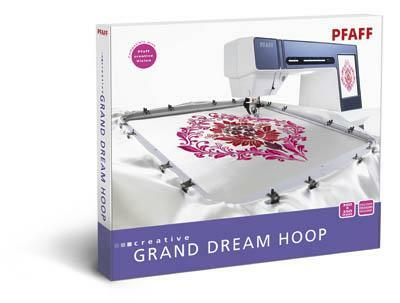 Your creative GRAND DREAM HOOP offers an embroidery area of 360 x 350 mm. This is the largest hoop on the market and we hope that you will enjoy it! 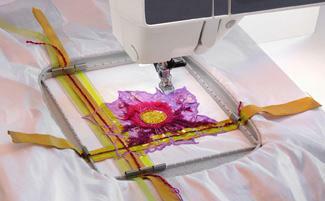 You can start to embroider right away using the enclosed design created especially for the GRAND DREAM HOOP. 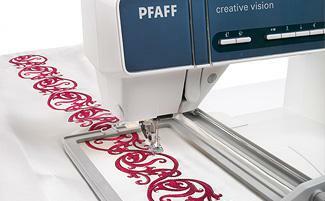 For more Embroidery Collections, visit your local authorized Pfaff dealer. There are two designs coming with the hoop and a third design can be downloaded from www.myembroideries.com at a special price using a promotion code. To decorate your fashion and home dec projects with beautiful embroidered borders, the creative� ENDLESS HOOP II is the perfect accessory. You can stitch design over and over again, making it as long as you want without any complicated re-hooping. Two free designs included and one design can be downloaded from myembroideries.com at a special price. Hooping delicate, specialty fabrics with your creative� AIR HOOP gives the best hooping results ever. Even the most delicate and thin fabrics, like velvet, organza and silk-satin are quickly and gently set in place and held taut in the creative� AIR HOOP, without leaving any pressure marks on the fabric. The hoop is easily inflated with the included foot pedal, leaving both hands free for handling the fabric. 820892-096 for PFAFF� creative vision� sewing and embroidery machine, PFAFF� creative� 4.0 sewing and embroidery machine, PFAFF� creative� 2.0 sewing and embroidery machine. Finally a hoop that fits all your needs! 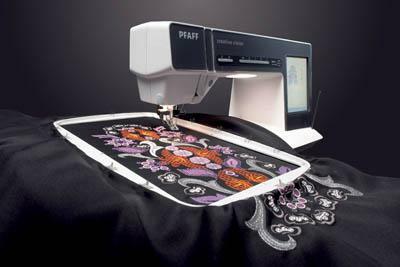 One outer hoop with the Pfaff �Quick release� and two different inner hoops makes embroidering with the Pfaff creative ALL FABRIC HOOP II so easy! Simply choose the �Light� inner hoop for lightweight fabrics and the �Heavy� for heavyweight fabrics or fabric/batting layers. Your creative� TEXTURE HOOP is the perfect tool when you want to make unique embellishments on your quilts, sewing projects and garments. Use the hoop together with yarn and ribbons with different textures combined with embroidery designs or stitches to change the look of your projects. There are also specially designed stitches on the CD that can be combined into a unique design. As an extra bonus, four extra designs are found on the CD put together by these stitches. Two designs come with the hoop (a third may be downloaded at www.myembroideries.com to a special price). You can also use the hoop together with any design fitting the 6� x 6� (150x150 mm) size hoop. 820919-096 for PFAFF� creative vision� sewing and embroidery machine, PFAFF� creative� 4.0 sewing and embroidery machine, PFAFF� creative� 2.0 sewing and embroidery machine. 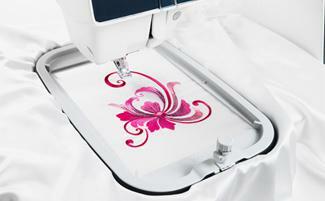 Hoops the fabric for perfect stitching results for embroideries up to 360 x 200 mm. The Quick Release makes hooping easy. Hoops the fabric for perfect stitching results for embroideries up to 260 x 200 mm. The Quick Release makes hooping easy. 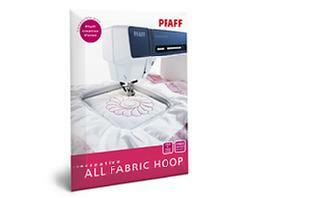 Hoops the fabric for perfect stitching results and for embroideries up to 240 x 150 mm. The Quick Release makes hooping easy. Hoops the fabric for perfect stitching results and for embroideries up to 120 x 120 mm. The Quick Release makes hooping easy.